Ronnie Floyd, M.Div., D.Min., has served as the Senior Pastor of Cross Church in Northwest Arkansas since 1986. In June 2016, he completed a two-year elected term as President of the Southern Baptist Convention. Dr. Floyd’s ministry as a local church pastor has been one of commitment, evangelism, discipleship, prayer, and the advancement of the Gospel to America and around the world. He also continues to lead in the advancement of racial unity and championing spiritual awakening in America. Dr. Floyd is the author of 20 books, including: The Power of Prayer and Fasting, 10 Things Every Minister Needs to Know, Our Last Great Hope: Awakening the Great Commission, and FORWARD: 7 Distinguishing Marks for Future Leaders. His most recent book, Living Fit: Make Your Life Count by Pursuing a Healthy You, will be released in June 2018. 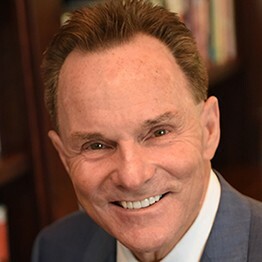 In March of 2017, Dr. Floyd began a weekly podcast titled, Ronnie Floyd on Life and Leadership Today. Pastor Floyd’s proudest accomplishments stem from his personal life. He and his wife, Jeana, have been married for 40 years and have two sons.